International acclaimed modelling competition, Elite Model Look which takes place in over 80 different countries is back, bigger and better for its 2012 edition. The prestigious competition has tremendously accelerated the careers of many aspiring and upcoming talents to become International top models and this edition will not be different. Elite is offering thousands of girls and boys the opportunity to achieve their dreams and walk in the footsteps of top models like Tyra Banks, Naomi Campbell, Tyson Beckford, David Agbodji, Ty Ogunkoya, Cindy Crawford and Gisele Bundchen. 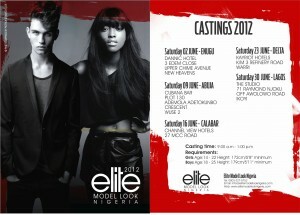 The Elite Nigeria team is set to storm Calabar, Enugu, Abuja, Delta and Lagos for castings from Saturday 2 June, 2012 – Saturday 30 June, 2012. With the Elite Model Look Nigeria celebrating its 5th year anniversary, it aims to offer maximum opportunities for women and men to participate in one of the most renowned modeling contest and to maintain its reputation of being the world’s most prestigious agency. At the end of the castings, 100 contestants will be selected to participate in the national contest that will be held in Lagos. After a rigorous screening exercise, 10 girls and 10 boys would be selected to participate in the finale on Saturday 1 September, 2012. Winners are not only selected based on their photogenic qualities, their personalities and their natural beauties but also on their potential to co-respond to current fashion trends. The Elite Model Look Jury comprising of various individuals in the fashion and modeling industry will choose the most qualified contestants for the finale. The ultimate goal of this contest is to win a place in the World Final set to bring together different girls selected in different countries to secure a 3 Year contract with the Elite Agency. Prizes Female The Elite Model Look Nigeria winner will represent Nigeria alongside 80 other countries and will get a chance to win 150,000 USD at Elite Model Finale in October 2012 in China. All applicants should come to the casting venues with two recent pictures of themselves – A head shot and a full body shot. If you are under the age of 18, a parental authorization letter is required at the casting venues. Applicants should wear as little make-up as possible and wear outfits that show their figures (Ladies – Skinny jeans or leggings and Gents – A Basic T-Shirt & Jeans). Female applicants should come to the casting venues with their natural hair. False eyelashes or coloured fingernails would not be accepted.